Saving and Improving the Lives of Roswell NM Dogs and Cats! Everything you need to know to foster a dog or cat-view, print or save pdf. FORA Foster Handbook - Foster an animal...save a life. One of the most important things you can do to help the Shawnee animals is to foster a dog, cat, puppy or kitten. Each year we help rescue organizations pull hundreds of animals from the shelter. These rescues are located elsewhere in Oklahoma or are in another state. The rescues need a little time to arrange transport and secure long-term fosters in their area. Meanwhile, the animals just pulled from the shelter need a bit of additional time, rest, recuperation, vaccinations, health certificates and/or other medical care or socialization before they are ready to be transported to the rescue organization. And, many rescue and transport groups require at least 14 days in a temporary foster home before they are transported. We depend on our dedicated foster families to fill this gap and give these animals a quiet respite away from the hubbub of shelter life until they are ready for to be transport to the next stage of their journey! Here is a summary of frequently asked questions - you can also give us a call at 575-208-4869 and we would be happy to discuss fostering and answer any questions! Most foster families already have dogs or cats or both. The key to fostering is proper introduction which often includes initial separation until the critters get used to each other. Our foster handbook explains this in detail. WILL THE DOG,PUPPY or KITTY ALREADY HAVE HIS SHOTS? Yes - their first stop after being pulled from the Animal Control facility is straight to the vet! WHAT HAPPENS IF MY FOSTER DOG OR CAT GETS SICK OR HAS AN EMERGENCY? Our vet will provide all necessary care and it is paid for by FORA. If you are not able to take your foster to the vet, one of our foster cooridinators can assist. The average foster period until transport to a partner rescue is 2 weeks. Sometimes it is less, sometimes a bit more. For dogs or cats in the FOSA rescue program, the fostering period is until adoption. We will discuss with you what type of fostering works best for your family! WHAT IF IT DOESN"T WORK OUT WITH THE FOSTER IN MY HOME OR MY OWN PETS DON'T GET ALONG WITH OUR TEMPORARY GUEST? Please be assured that should you encouter any problems with your foster we will make arrangements to pick him or her up immediately. We want fostering to be a positive experience for everyone involved, so you don&apos;t have to feel obligated to keep a foster in your home if you feel it isn&apos;t working out. The first step is to fill out a foster application. Next, you will be contacted by a Foster Ambassador. We provide training and all the supplies you will need. Please take a moment to fill out our Foster Application whether you live in Roswell or elsewhere. The FORA Foster Handbook helps prepare you for fostering and answers many questions on welcoming your new little fury quest to your home. To View, Click the "View Handbook" button. 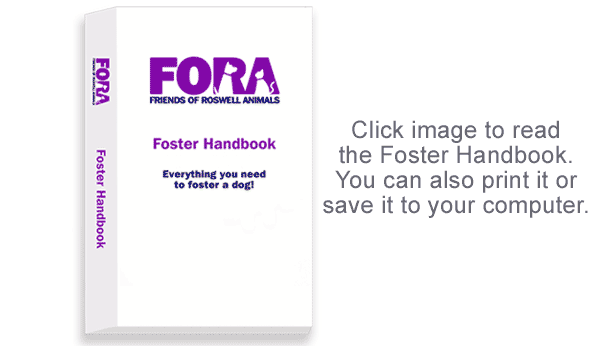 You can also print or save a a copy of the FORA Foster Handbook to your computer. Foster Ambassadors are your support network. They will meet with you to learn more about your family and current pets - making sure to match the temporary foster with your preferences. They also make sure supplies are delivered to you and are always available to answer questions or assist you.